Hair Garden Brings Back Bows! Hello, beauties! Anyone who has known me for a while knows I love a good hair accessory! My original go-to was always some sort of flower. I would get creative and create all types of designs! I had a variety of flower adorned combs, clips and pins. One day I had an accident with my hot glue gun and decided to shelve my hairdos making project for a while. Now I am ready to create again, only very carefully this time! Ha ha! I have started making a few headbands and clips so far. What do you think? I’ll post more of my accessories as they come along! Thanks for stopping in! 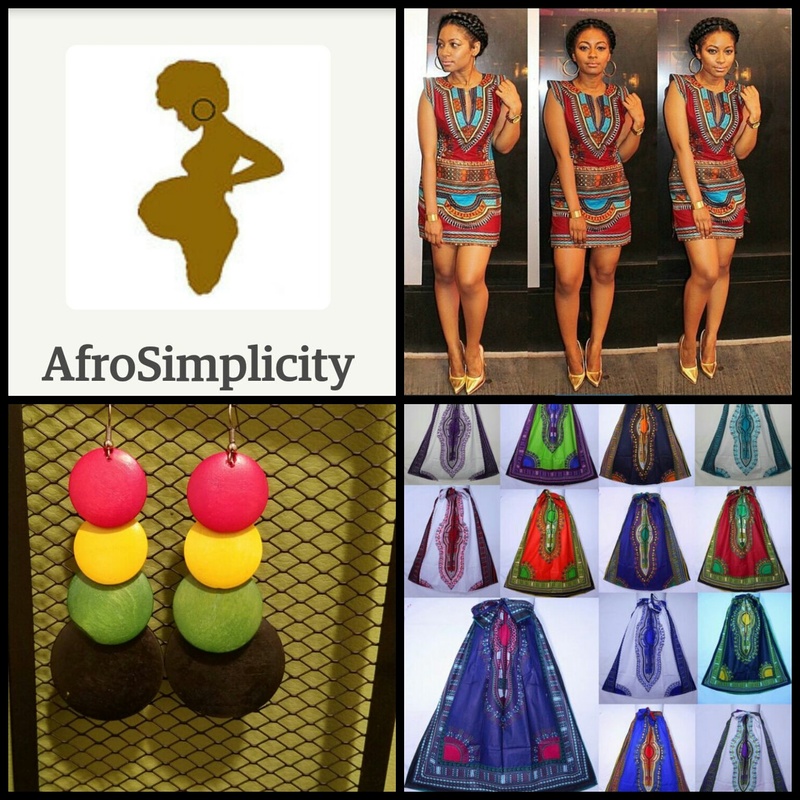 Author AphropuphsPosted on November 8, 2017 November 8, 2017 Categories Hair Accessories, Hair Care, Naturally FashionableTags affordable products for natural hair, african print bows, african print hair bows, afro hair, Etsy, Etsy seller, etsy shop, Hair bows, hair clips, handmade hair accessories, headbands, Kente bows, kids hair bows, kids hair care, natural hair, natural hair accessoriesLeave a comment on Hair Garden Brings Back Bows! Hello, lovelies! 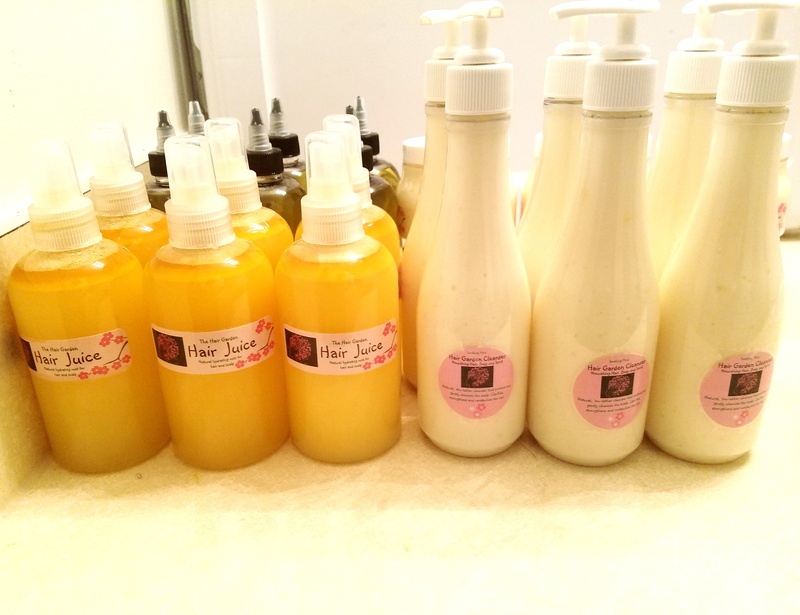 This past weekend I visited Taliah Waajid’s World Natural Hair & Beauty Show. This show is a bi-annual favorite for me. 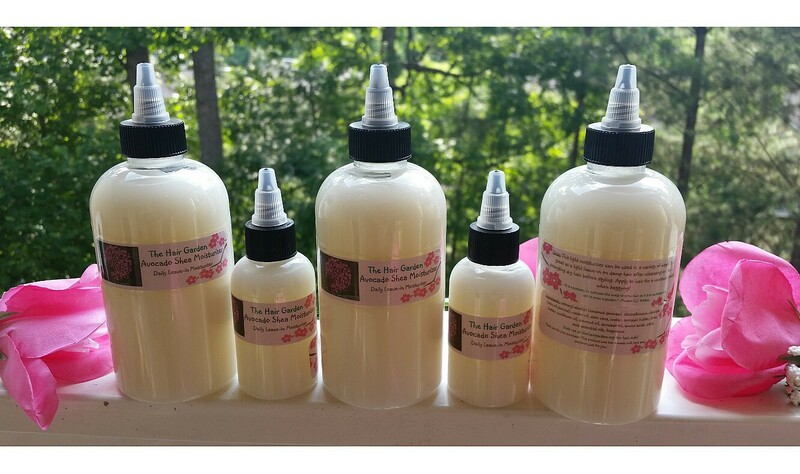 I find great soaps, shampoos, conditioners, lotions, t-shirts, accessories, etc. My main shopping preferences are a variety of hair products and t-shirts but this year I was on a tight budget so I was doing a lot more looking and card and sample collecting! It is always great to see so many beautiful natural and creative entrepreneurs. Anyone who knows me knows that I have a love for anything with African lace, kente fabric and African print. 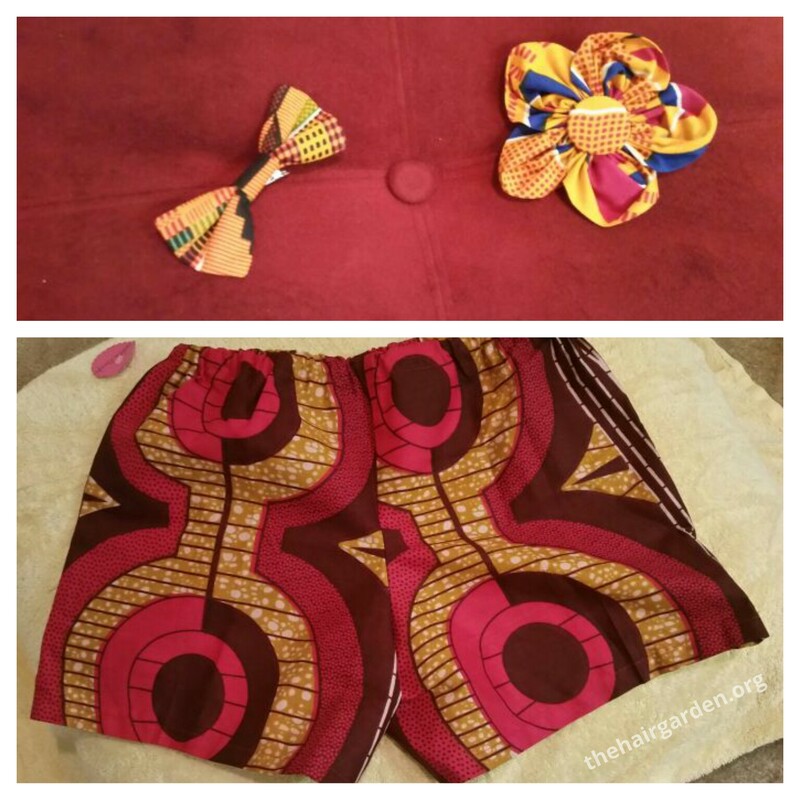 I grew up with the more traditional garments that came straight from Ghana. Anything you would find locally is usually really pricey so it is exciting to see them more readily available and in more contemporary styles and at an affordable price! There were many booths at the hair show but this one booth I stopped at had this breath-taking dress hanging up front and was tied with an amazing belt. It would help if I took a picture of t it, huh? But I am sure it will be available on her website! Anyway, I stopped at this amazing booth and was a little hesitant due to many of the sky-high prices I had been quoted earlier that day. 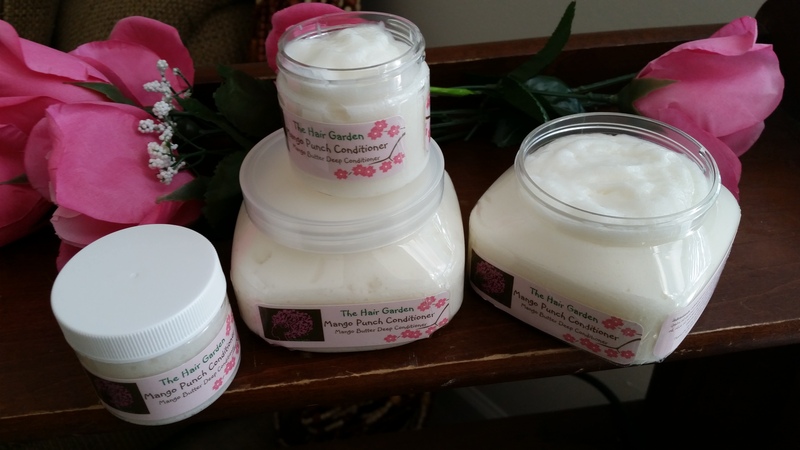 Pleasantly, her prices were very affordable and the quality of her products were outstanding! I didn’t end up getting the dress but I picked up some other things! She had a booth with another young lady who made accessories as well and I am about to tell you all about them. 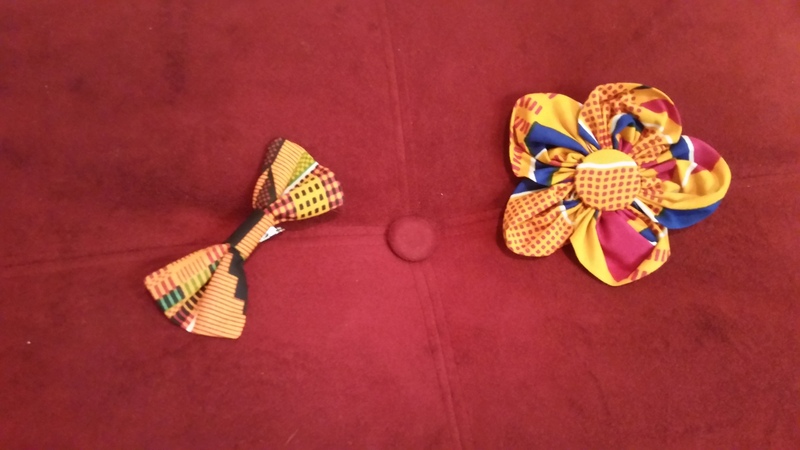 I purchased a kente fabric bow for $5, a kente fabric flower for $10 made by Aya Donna. Her flower bow is almost as big as my hand so it is a good size as well as the bow! Her website is www.AyaDonna.com! She also has a shop on Etsy! Adornments for the hair and clothing! 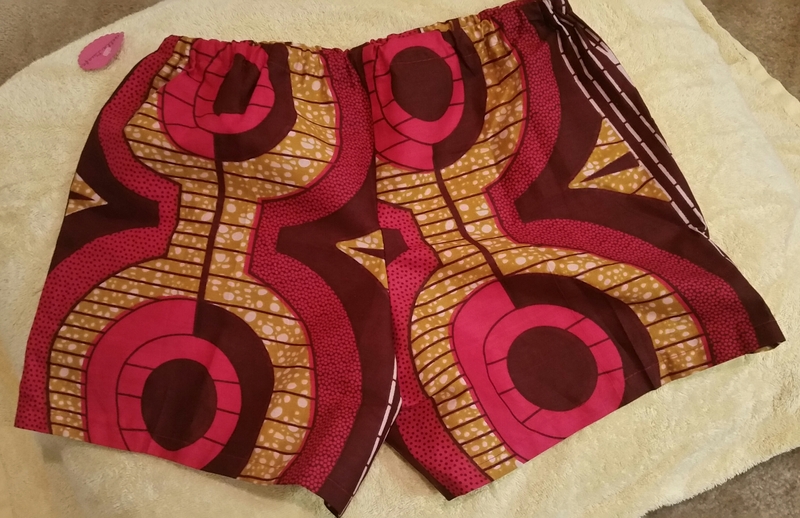 I picked up these snazzy pair of shorts by Bella Duafe for only $25. I am more of a skirt type of gal but I could not resist these! She had two tops that matched the shorts perfectly but of course I couldn’t get either one. The first was a tube top. Very cute! 10 years ago, I wouldn’t have thought twice. I t would have been mine! But this is now and 1. I was sure if I had enough boobage for it and 2. The tube top would only cover my breasts and not much else! The others matching top, I adored, but my size was sold out. Maybe that was a good thing because I was already beyond my $20 budget! I got to meet the designer herself and she was really nice! It made my purchasing experience even better. She pulled out her pop-up dressing room so I could try them on and they were a perfect fit and it is hard for me to find shorts that don’t fit awkwardly! Find more of her garments and accessories in her Etsy shop at www.etsy.com/shop/belladuafe. Any suggestions for a cute top that I can wear with these? Denim top perhaps? Brown button up or tank ? I would love your input below! Author AphropuphsPosted on April 28, 2015 Categories Naturally Beautiful, Naturally FashionableTags afforable african print clothes, affordable kente print clothes, african fashion, african print bows, african print clothes, african print hair bows, african print shorts, atlanta natural hair show, handmade hair accessories, kente print clothes, natural hair accessories2 Comments on African Prints for Spring!! Ahhh! Marriage. It’s a beautiful thing. However, when it came time for me to make that huge transition in life, I did not want to go the traditional route and spend all sorts of money. I had made the move to Atlanta not too long ago and was only working part-time. On top of that, I was never one who wanted a huge wedding. I had been a bridesmaid enough times to know that the whole process of planning a wedding was something I absolutely did not want to endure. It was nice, but it was not how I envisioned spending my last few months of being single! I wanted a small and intimate wedding with just immediate family and I wanted to process to be as simple and enjoyable as possible. Originally, we planned a nice Vegas destination wedding. I was going to pay one flat fee and all the decorations and planning would pretty much be taken care of for me! All I had to do was show up and smile! However, it was beginning to inconvenience many of the family we wanted to be there. We changed our minds and decided to do something small and intimate locally. I just wanted to do a break down to let share how you too can have a perfect wedding without breaking your budget! First, hair! As you know, I wanted a style that was natural as well as elegant for my day. 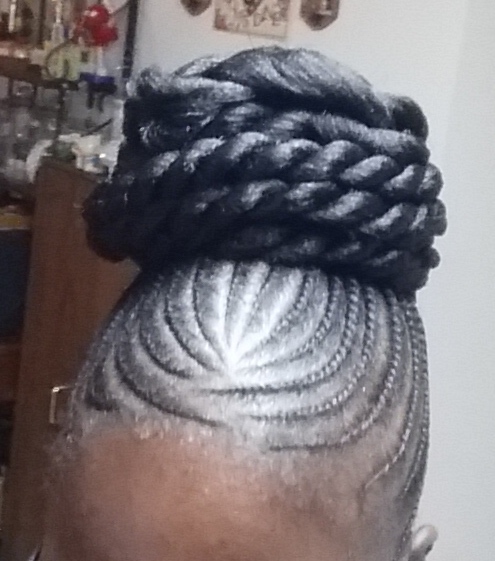 I got it done at the local African braiding shop, Matou African Braiding. The hair extensions for the bun was included and the style cost $80. *While I loved this hairstyle, I paid for it in more ways than one! Please see, When Someone Tramples Your Hair Garden! I did my own make-up so there was no additional costs there. The comb with the pearls in my bun came from Hobby Lobby and at 50% off came out to $5. My blusher also came from Hobby Lobby and at 50% off it came out to only $10! My bouquet was prearranged at Michael’s and I actually picked a lot of green leave out of it to get it to look like I wanted it to. I bound the ends with some pink ribbon. The bouquet cost $15. Jewelry was my something new and something borrowed and they were both gifts from my mother so no additional costs there. Dress! I went into a dress shop at the mall called Scarlet looking for a fashionable belt for another outfit and my eye caught this white lace dress. I wasn’t look or even expecting to find my dress there because this was more of a nightclub wear shop. I said yes to the dress once I saw the price tag: $39.99! 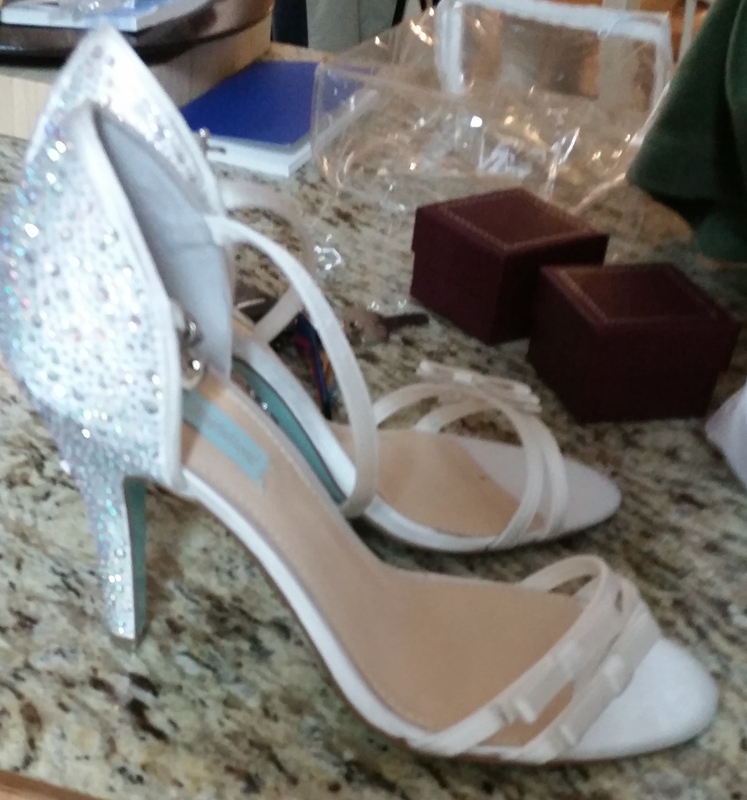 I ventured into a department store that I had never heard of before called Von Maur and I found the perfect shoes! They were on clearance (where I always shop) so I was convinced that my size wouldn’t be available but they were! Betsy Johnson shoes for $25! Mani-Pedi and brow wax came out to $60. I ordered a simple cake from Publix that totaled $45. 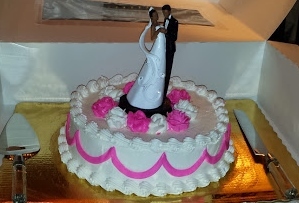 Cake topper came from Hobby Lobby and at 50% off was $10. 4-pack of champagne for our toast rounded to $10. 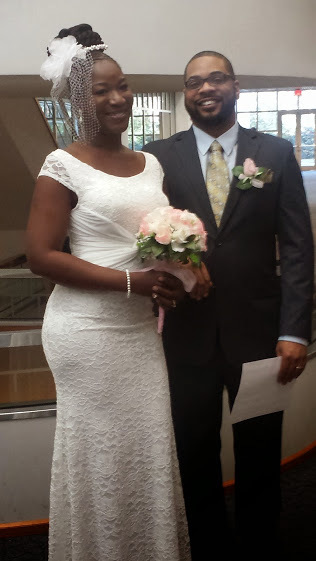 Marriage license was $60 and courthouse wedding was free! We had a simple dinner at Bone’s afterwards. Everything else was donated as wedding gifts from friends and family! No photographer or videographer needed because my good friend and partner in crime (KurlFriend) came in and took care of all of that for us! We got plenty of lovely and memorable photos between her and the family! That was pretty much it. I was able to pull off one of the most special days of my life for just under $400! It took a little patience but I was able to pull it off and wouldn’t have my day any other way! We will have a reception in the spring for all of our family and friends to come and celebrate with us and then we are off to our honeymoon! I took what was starting out to be a headache and turned our union into an enjoyable and affordable experience with wonderful memories! I wanted our day to focus on our union and the commitment we were making to each other so this was the best option for us! 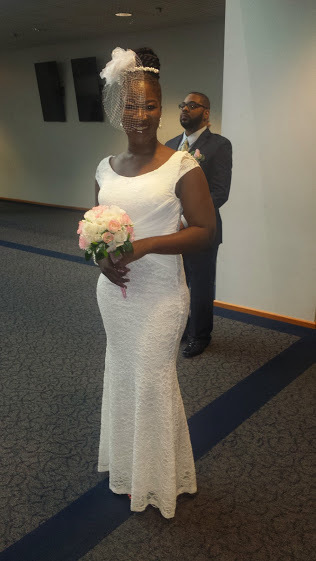 How did you pull your special day together or how do you plan on doing so? I would love for you to share in the comments section! Thanks for visiting The Hair Garden! My Scarf! Great for Good and Bad Hair Days! Whether you want to spice up your look or need a quick cover-up to leave the house, try a scarf!! I tie my hair for a variety of reasons but today I just needed a quick fix for a hair dilemma. I sometimes opt for a scarf or head wrap depending on the weather. This is accessorizing option is great for just about anyone! The interior of my braids were still wet from my cleansing last night and it was kind of old out today so I wanted to cover up. A hat was not an option and neither was a blow dry so I grabbed my velvety black scarf! This was an excuse for me to get creative because I have always loved to tie my hair up in some interesting way. 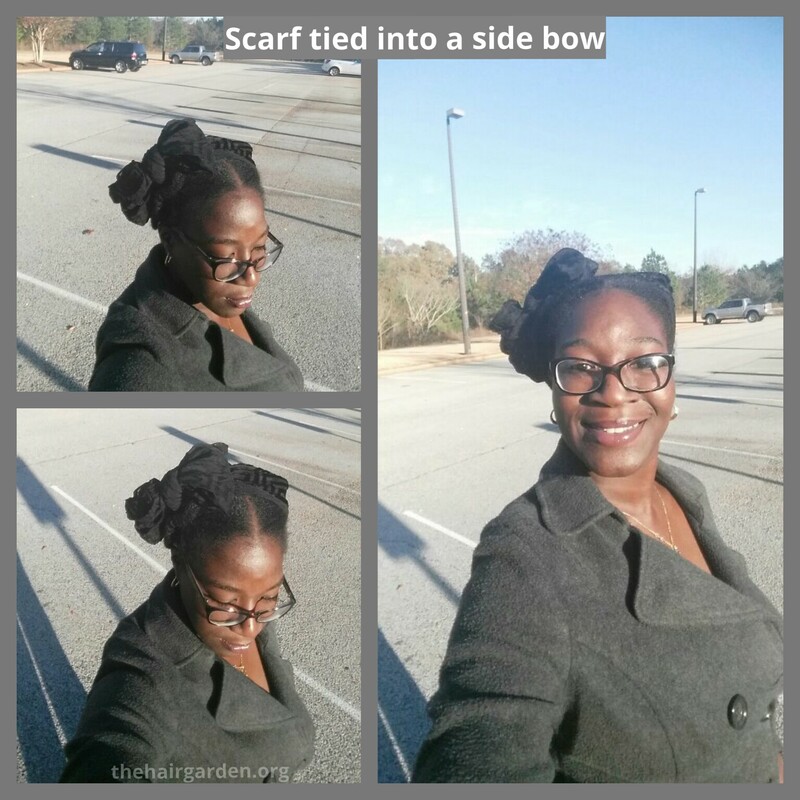 I pinned the braids back and simply tied the scarf in a bow on the side and went about my day! I do this all the time with a variety of colors This was the look I wore today. 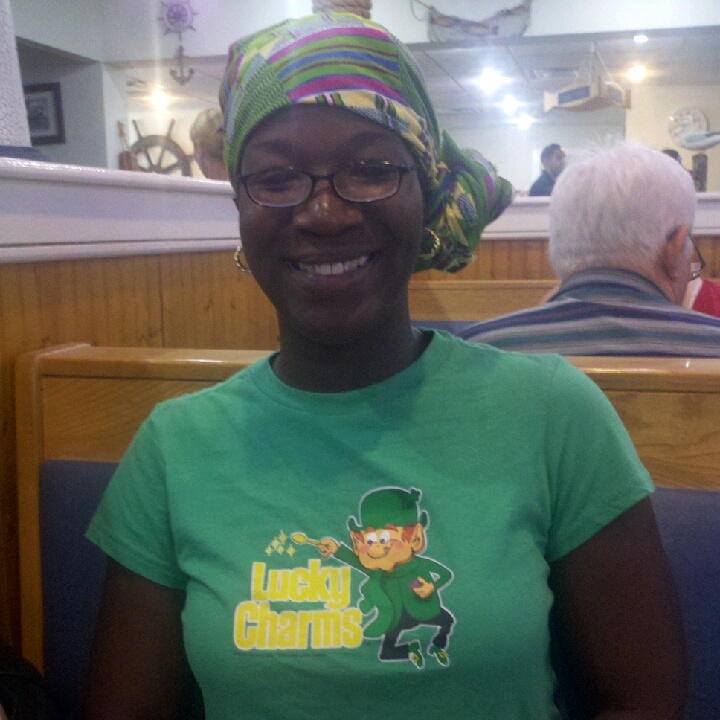 Below are a couple of older pictures of my hair wrapped or tied! 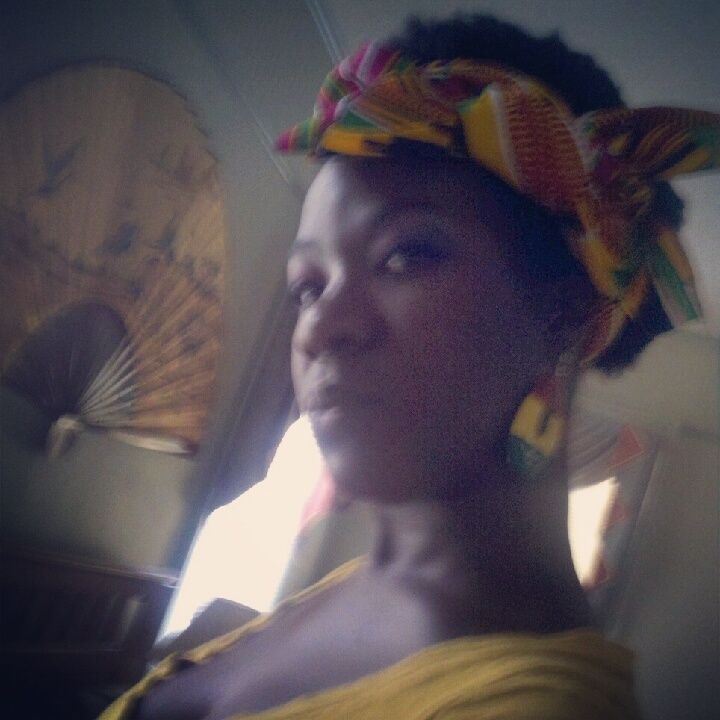 Author AphropuphsPosted on November 19, 2014 Categories Naturally Beautiful, Naturally FashionableTags hair wraps, kenteLeave a comment on My Scarf! Great for Good and Bad Hair Days!